An Indonesian passenger plane carrying 54 people that went missing yesterday in the country's easternmost, mountainous Papua province could have been found by villagers, an official has said. "Information from the villagers is that the plane crashed into Mount Pango in the Bintang Mountains regency. We are trying to verify claims that the wreckage has been found," director-general of air transport Suprasetyo, who goes by one name, told a press conference last night that was broadcast live. Mr J.A. Barata, the transport ministry spokesman, said at the same press conference: "Full search-and-rescue efforts by land and air will start tomorrow as it has gotten dark now. A team was deployed tonight but we don't expect much. The terrain is rough." The Trigana Air's ATR 42-300 plane lost contact 31 minutes after it departed Jayapura, capital of Papua province, at 2.22pm, enroute to Oksibil, the capital of the Bintang Mountains regency. 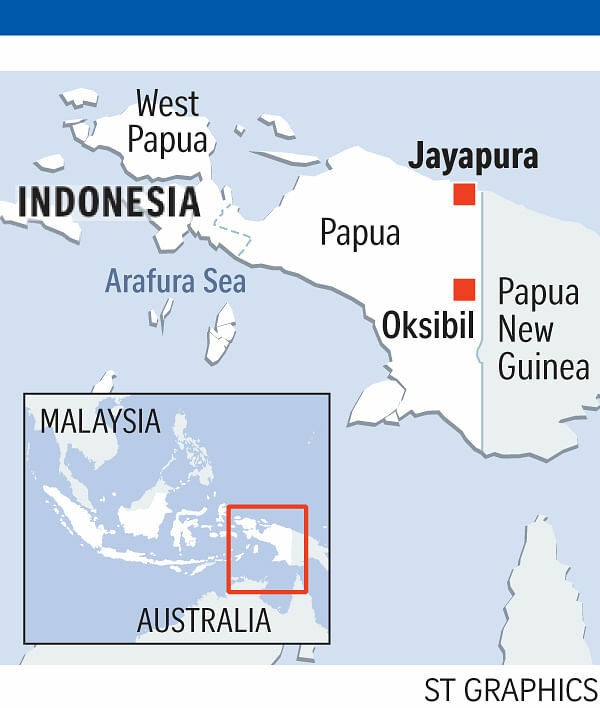 The trip between Jayapura and Oksibil normally takes about 45 minutes. The plane was carrying 49 passengers - 44 adults, two children and three infants - and five crew members, Mr Barata said in a text message reply to queries from The Straits Times. About 10 minutes before it was due to land, the plane contacted Oksibil control tower asking to descend, but the plane never arrived, Captain Beni Sumaryanto, Trigana Air's service director of operations, told AFP. "Oksibil is a mountainous area where weather is very unpredictable. It can suddenly turn foggy, dark and windy without warning," he added. Meanwhile, Mr Ludianto, head of Jayapura's search and rescue agency, told Elshinta news radio station: "We can't yet establish the cause of the accident - technical problem or the weather." Another plane from Trigana Air was deployed from Jayapura yesterday to comb the areas near Oksibil, flying at 4,000m, but it could not find the plane. It returned to base before dusk. Today, about 80 search and rescue operations personnel will be deployed on the ground simultaneously with the air operations that will involve a few aircraft, said Mr Ludianto, adding that the military will also help. It has suffered 14 serious incidents since it began operations, according to the Aviation Safety Network which monitors air accidents, AFP reported. The airline is on a blacklist of carriers banned from European Union airspace. Small aircraft are commonly used for transport in remote, mountainous Papua and bad weather has caused several accidents in recent years, reported AFP. Last Wednesday, a Cessna propeller plane operated by Indonesian company Komala Air crashed in Papua's Yahukimo district, killing one person and seriously injuring the five others on board. Officials suspect the crash was caused by bad weather, said AFP. Indonesia's aviation safety record has been patchy in recent times. Last December, an AirAsia plane flying from the Indonesian city of Surabaya to Singapore crashed in the Java Sea in stormy weather, killing all 162 people on board. In June, an Indonesian military plane crashed into a residential area in North Sumatra's Medan city, killing 142 people.